This post is part of Tero Karvinen’s course: Linux as server. Even it is related to school mission it will offer usefull information about GNU/Linux! All tests made with Xubuntu 12.04 LTS Precise Pangolin 32bit. First I needed two sites static and dynamic ones. I already had wordpress installed so I decided to use that as dynamic site. I went to index-page of WordPress with Firefox, right-clicked on site and then pressed “View Page Source”. I had source of singe wordpress-page which I could use as static page. I copied the source to clipboard and went to terminal. Both pages looked exactly the same. What makes them different to each other is that page on http://localhost/~tuukka/wordpress/ is build from mysql database with php, html and css. Static page just contains pure html and css. I made same tests again with new pages. I got totally different kind of results with new setup. 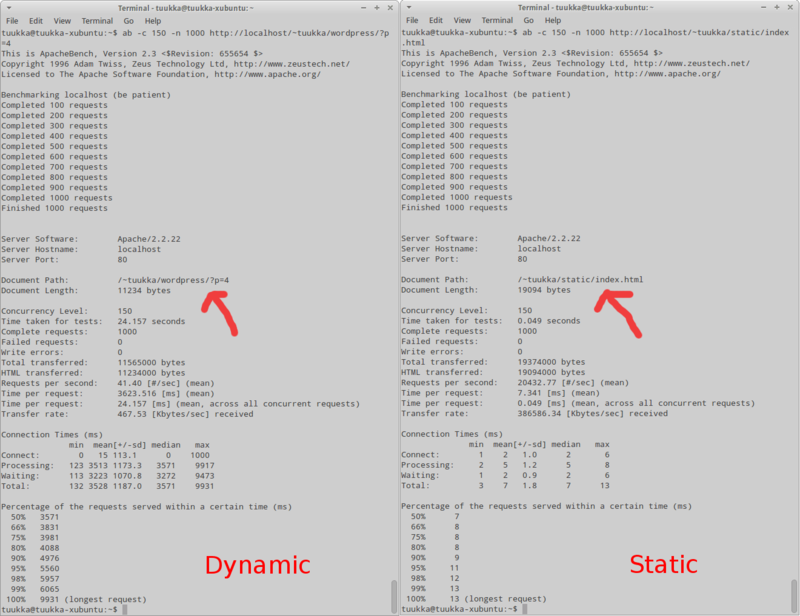 1000 page loads 150 at the same time took 24.157seconds with dynamic page and 0.049 with static page. Then I made apache to listen on port 8080 instead default 80. I edited ports.conf lines NameVirtualHost and Listen. 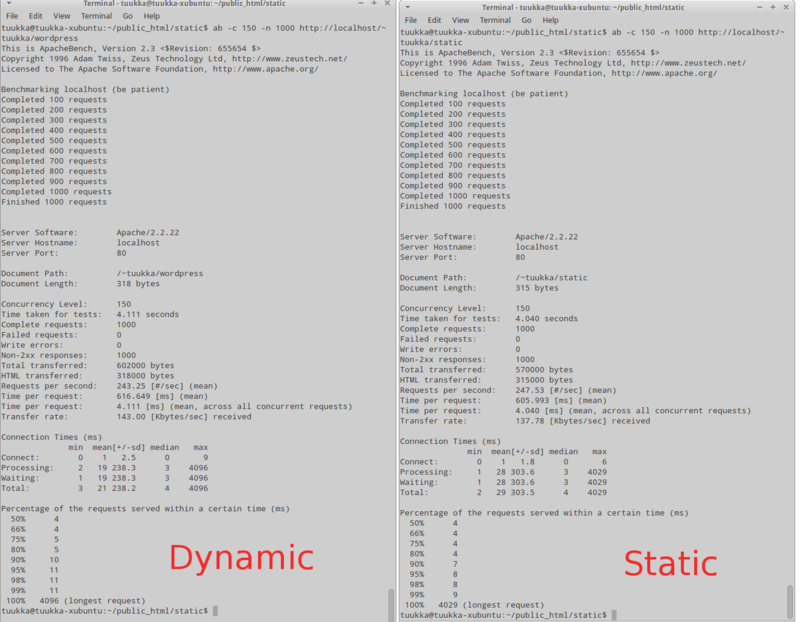 I also made changes to /etc/apache2/sites-enabled/000-default as the third line in ports.conf said. 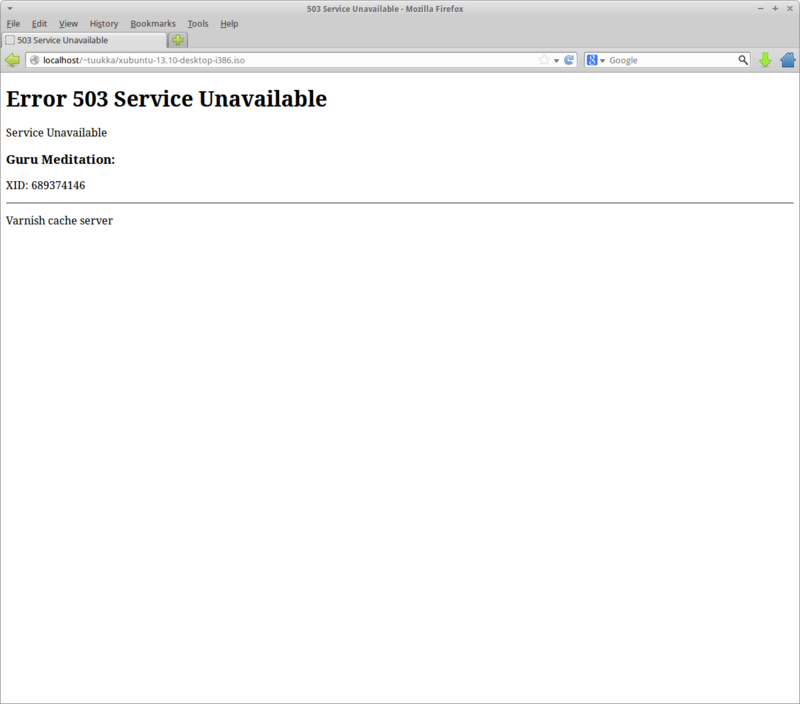 Tested if it was working by restarting apache and trying to load page. Then the varnish setup. 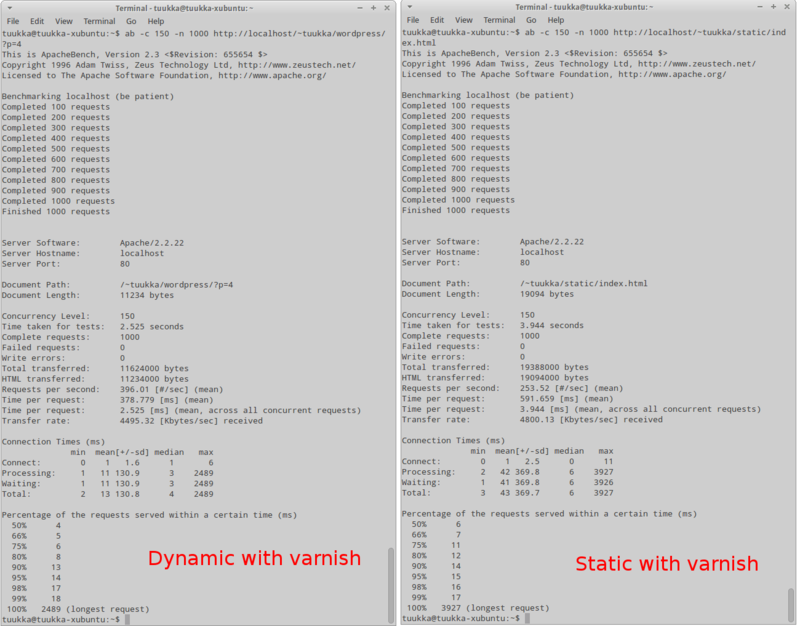 I made changes to /etc/default/varnish. Then I restarted varnish and tried if it was working. This led me to apaches default “It works” page and I noticed that varnish is working since apache is not listening default port. Varnish is now configured and working. I made same tests again. With these results I would say Varnish is must if there is huge amount of traffic with dynamic pages. First I tried what happens if I am trying to download .iso image through Varnish. 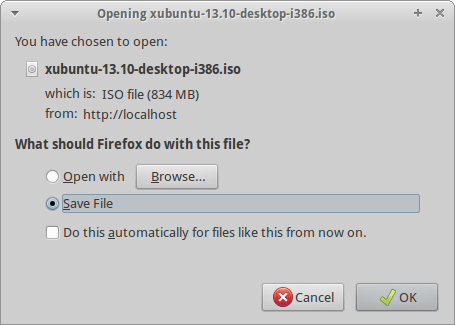 I downloaded xubuntu-13.10 .iso and putted it under the public_html. I tried to download it and I got this funny guru meditation page. I am not quite sure what is exact reason for it. I guess it might be something related to memory of Varnish. I googled a bit and found this Jukka Pentti`s blog. He was tried to make this work by editing /etc/varnish/default.vcl put did not tested it. Obviously there is something wrong with the script I just added to default.vcl. I tried some debugging with this but it did not solved. I decided to google again and I found mikkott`s blog where he solved problem by passing all over 200mb files from varnish. Then I restarted Varnish and tried to download .iso again. After that guru did not meditated again and I was able to download .iso! Yslow is plugin for firefox. I installed it from firefoxes add-ons manager. It was not working out of the box. Turned out that it might need firebug plugin to work. I installed firebug and reboot firefox. Made inspection with firebug(right clicked somewhere in any page) and after that yslow was also working. This page has 4 external stylesheets. Try combining them into one. 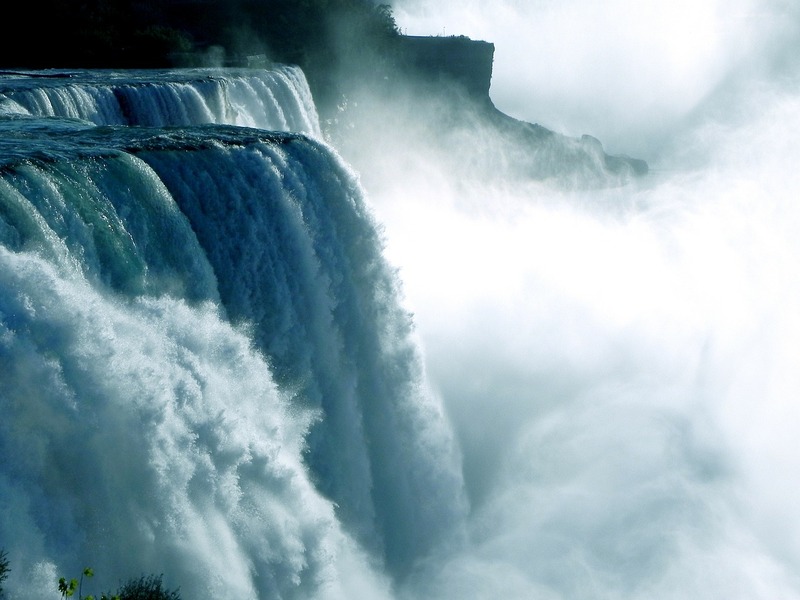 This page has 25 external background images. Try combining them with CSS sprites. Welcome to tuukkamerilainen.com tech blog !